Developers selling on the WooCommerce Marketplace can edit product pages, access information like usage data and sales, and manage reviews for their products. Name: The name of the product, as it appears on the product page. Note that this may be different from the product slug or URL. Single-site subscription: The base price for a single-site subscription of the product. Last updated: The date when the latest version was uploaded, and a link to the changelog. Categories: The categories the product is listed under. Short Description: The tagline for the product, more on this here. From there, you can see information about usage, upload a new version or edit the product page. To edit a product page, select Edit Product Page from the product overview. For more on how to make the most of your product pages, read the guidelines for writing marketing content. In the product overview, the Statistics tab includes usage information to help developer know what versions of relevant technologies are used with a given product. These statistics comes from the WooCommerce Tracker and are based on stores that allow for usage tracking. 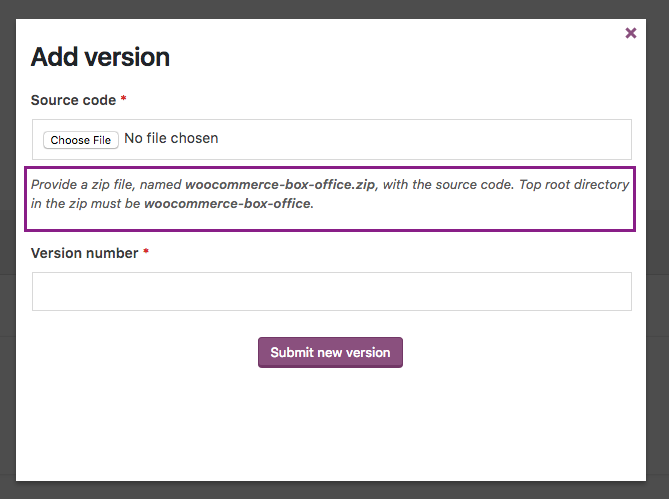 Developers can use this information to make decisions about what versions of WordPress, WooCommerce and PHP to support. To upload a new version, select the Versions tab. You’ll see all the versions you’ve previously uploaded, including highlights about what was in each version. Confirmation: Vendor Admins will get an email when a new version is submitted, confirming that it is in the queue. No action is needed here. Rejected: If a version fails any part of our automated testing, Vendor Admins will receive an email letting them know, including the specific error. Developers should try to resolve the error and submit a new version when ready. Live: If a version passes automated testing, it will be automatically deployed and made available to customers. No action is needed. The date format, the space between the -, and the word version are all important there. If an upload fails, there are a few common errors you should check first. That a changelog is present – a file named changelog.txt must be present to serve as a record of what’s changed from version-to-version. The changelog format – more on what this should look like here. Earnings: New sales, renewal sales, and refund amount. Commissions: The amount earned by the Vendor from all sales. Subscriptions: Total active subscriptions, including new and renewing this month, as well as refund rate, renewal rate, and a breakdown for 1-, 5- and 25-site packs. To find this information, log in to the Vendor Dashboard and go to Extensions > Sales Report. Data is available starting November 2017. Customers who have purchased a product may leave a rating and review. When there are a minimum of 10 ratings, reviews are show on the product page, and ratings are visible on the product page, category page, and in search results. Read our guidelines around ratings and reviews. Whether reviews are public or not, Vendor Admins can see reviews for their own products by logging in to the Vendor Dashboard and then going to Extensions > Reviews.